You’re hosting Thanksgiving this year and your guests will arrive within the hour. What are you doing now? Hoping there’s still food to snack on after they’ve all gone home. Checking off the last thing on my do-to list: answering the doorbell looking fabulous and well-rested. Snipping a few last-minute herbs from my garden to toss in the salad. Putting a cute little pilgrim costume on my bulldog. As the holidays approach and you begin dreaming of the perfect Thanksgiving, what are you most excited about? Cooking a perfectly tender, delicious turkey — one that brings the season to life and wows each and every guest. Using leftovers from the feast to create amazing and delicious new recipes my family will love after our guests head home. Finding unique and creative ways to get as much prep done ahead of the big day. I want to take care of the finer details early, so I can catch up with family and friends throughout the big day. Making sure everyone has a good time and gets in the holiday mood. You want to make this year’s Thanksgiving gathering extra special. What’s the biggest thing on your mind? Trying three no-fail gravy recipes just to make sure I’ve nailed the perfect one. Filling the front yard with scarecrows, hay bales, pumpkins, candy-corn-colored lights and pots of red, orange and gold flowers. Surprising my guests with fun new recipes that put a new, modern twist on Thanksgiving favorites. Deciding to cook a second turkey and maybe a ham so I don’t have to cook for a week after my guests enjoy an unforgettable meal. You’re determined to think of every possible thing to make hosting this Thanksgiving a stress-free affair. What your No. 1 priority? Having more than enough food ready to make sure I can make a delicious breakfast with our leftovers for guests staying overnight. Kicking off the holiday season with fun and interesting foods that make everyone happy. Making food that tastes as wonderful as my house looks. Searching online for recipes and ideas that will make the cooking easier. I start my holiday shopping as soon as possible. I transform my home into a fall festival with the colors, flavors and smells of the season. I watch football with my family and have my fill of delicious leftover turkey, mashed potatoes and pumpkin pie for at least a week after the feast. I come up with at least one menu item that is unexpected, interesting and gets everyone in the mood for the holidays. Your home is filled with pumpkin-spiced candles, aromatic holiday soaps, and the smell of hot cider simmering on the stove. You’re hooked on all the pleasures of the season — harvest colors, harvest flavors, harvest smells. You’re first in line at craft stores to pick up seasonal decorations that delight the eyes. You believe it’s not Thanksgiving without iconic foods like pumpkin pie, squash and a perfectly cooked turkey. This year, bring your affinity for fall to the Thanksgiving table with the new Jennie-O Harvest Menu, a collection of deliciously easy recipes that perfectly fit your entertaining persona. Inspired by favorite autumn flavors, the meal is a fantastic autumn feast, with colorful recipes like Orange Glazed Brussels Sprouts with Butternut Squash, decorative Poppy Seed Rolls, and a hassle-free JENNIE-O® OVEN READY™ Turkey. You’re known as the party planner extraordinaire because you leave nothing to chance. Guests are so amazed at your ability to effortlessly pull off creating an impressive — and delicious — feast year after year, it almost seems like magic. What they don’t know is that you take creative steps ahead of the big day to prep the Thanksgiving turkey, unique side dishes and delectable desserts, and make sure you have plenty of time to mingle with old friends and family. As you plan this year’s meal, the Jennie-O Make-Ahead Menu offers the ideal collection of recipes for your plan-and-prep holiday personality. Perfect for giving you more time with your guests and less time in the kitchen, it includes recipes with time-saving steps, such as seasoning and stuffing the turkey the night before and mixing up the salad dressing a week ahead. You love to surprise and delight your guests with amazing culinary creations, curating menus that are a fit for your family’s most festive occasions. As Thanksgiving fun transitions into the winter holidays, you’re constantly searching for new recipes that match the excitement of the giving season and the coming new year. You have fun experimenting with ambitious new flavors, textures and ingredient combinations that showcase your command of the kitchen. The Jennie-O Festive Holiday Menu is a great match for your modern, fun and eclectic entertaining style. Make your mark on the culinary world with sides like Spinach Puffs stuffed with crumbled tomato basil feta and ricotta cheese, and a JENNIE-O® Turkey complemented with notes of citrus and tart green apples. With convenient, festive foods for Thanksgiving and beyond, the menu is an instant classic. Do you have more fun planning the meal or eating the leftovers? Is your holiday table elaborately decorated and sophisticated or more laid back and inviting? 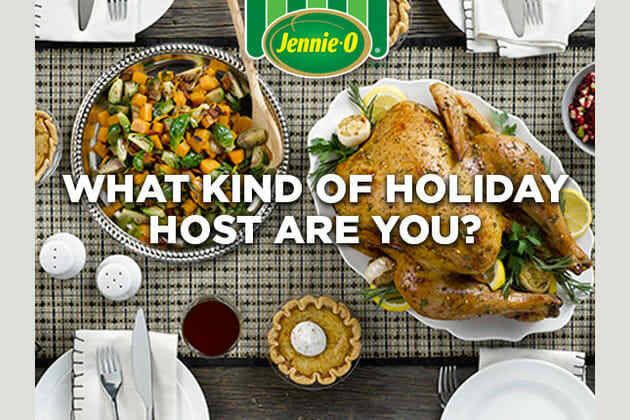 Take the Jennie-O “What kind of holiday host are you?” quiz to find out your modern entertaining style — and gain helpful recipes and tips to make deliciously easy holiday meals everyone will love (including you)!